Boon, R. L. . . . . . General Practitioner and Dealer in Drugs and Medicines. 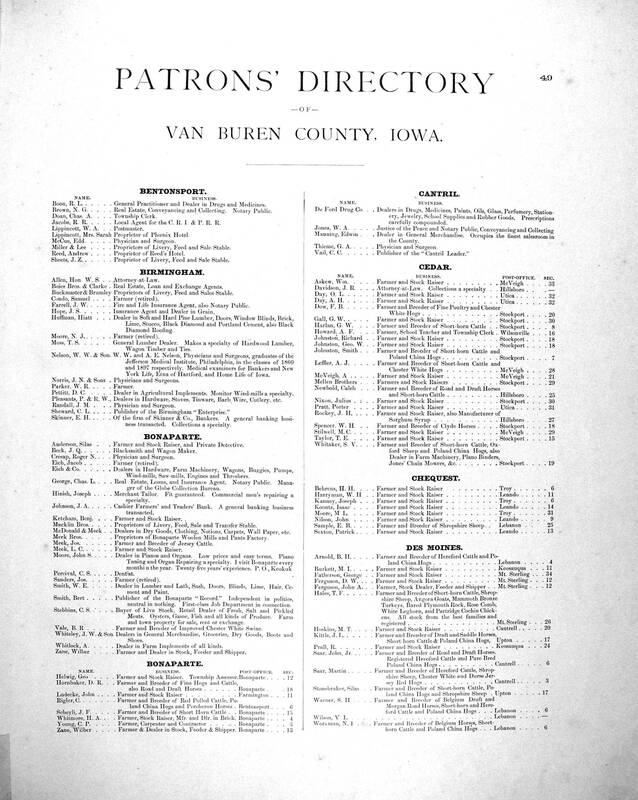 Brown, N. G. . . . . Real Estate, Conveyancing and Collecting. Notary Public. Doan, Chas. A. . . . Township Clerk. Jacobs, R. R. . . . . Local Agent for the C. R. I. & P. R. R.
Lippincott, W. A. . . Postmaster. Lippincott, Mrs. Sarah Proprietor of Phoenix Hotel. McCue, Edd. . . . . Physician and Surgeon. Reed, Andrew . . . . Proprietor of Reed's Hotel. Sheets, J. Z. . . . . . Proprietor of Livery, Feed and Sale Stable. Allen, Hon W. S. . . Attorney-at-Law. Boies Bros. & Clarke. Real Estate, Loan and Exchange Agents. Buckmaster & Brumley Proprietors of Livery, Feed and Sales Stable. Condo, Samuel . . . . Farmer (retired). Farrell, J. W. . . . . Fire and Life Insurance Agent, also Notary Public. Hope, J. S. . . . . . Insurance Agent and Dealer in Grain. Huffman, Hiatt . . . Dealer in Soft and Hard Pine Lumber, Doors, Window Blinds, Brick, Lime, Stucco, Black Diamond and Portland Cement, also Black Diamond Roofing. Moore, N. J.. . . . . Farmer (retired). Moss, T. S. . . . . General Lumber Dealer. Makes a specialty of Hardwood Lumber, Wagon Timber and Ties. Nelson, W. W. & Son. W. W. and A. E. Nelson, Physicians and Surgeons, graduates of the Jefferson Medical Institute, Philadelphia, in the classes of 1860 and 1897 respectively. Medical examiners for Bankers and New York Life, Etna of Hartford, and Horne Life of Iowa. Norris, J. N. & Sons . . Physicians and Surgeons. Parker. W. R. . . . . Farmer. Pettitt, D.C. . . . . Dealer in Agricultural Implements, Monitor Wind-mills a specialty. Pleasants, P. & R. W., Dealers in Hardware, Stoves, Tinware, Barb Wire, Cutlery, etc. Randall, J. M. . . . Physician and Surgeon. Sheward, C. L. . . . . Publisher of the Birmingham "Enterprise." Skinner, E. H. . . . . Of the firm of Skinner & Co., Bankers. A general banking business transacted. Collections a specialty. Anderson, Silas . . Farmer and Stock Raiser, and Private Detective. Beck, J. Q. . . . . . Blacksmith and Wagon Maker. Cresap, Roger N. . . . Physician and Surgeon. Eich, Jacob . . . . . Farmer (retired). Johnson, J. A. . . . . Cashier Farmers' and Traders' Bank. A general banking business transacted. Ketcham, Benj. . . . Farmer and Stock Raiser. Macklin Bros.. . . . Proprietors of Livery, Feed, Sale and Transfer Stable. Meek Bros. . . . . Proprietors of Bonaparte Woolen Mills and Pants Factory. Meek, L. C. . . . . . Farmer and Stock Raiser. Percival, C. S. . . . . Dentist. Sanders, Jos. . . . . Farmer (retired). Smith, W. E. . . . . Dealer in Lumber and Lath, Sash, Doors, Blinds, Line, Hair, Cement and Paint. Smith, Bert. . . . . Publisher of the Bonaparte "Record." Independent in politics, neutral in nothing. First-class Job Department in connection. Vale, B. R . . . . . Farmer and Breeder of Improved Chester White Swine. Whiteley, J. W. & Son Dealers in General Merchandise, Groceries, Dry Goods, Boots and Shoes. Whitlock, A. . . . . Dealer in Farm Implements of all kinds. Zane, Wilber . . . . Farmer and Dealer in Stock, Feeder and Shipper. De Ford Drug Co. . . Dealers in Drugs, Medicines, Paints, Oils, Glass, Perfumery, Stationery, Jewelry, School Supplies and Rubber Goods. Prescriptions carefully compounded. Thieme, G. A. . . . . Physician and Surgeon. Vail, C. C. . . . . . Publisher of the "Cantril Leader." Stonebraker, Silas . . Farmer and Breeder of Shorthorn Cattle, Poland China Hogs and Shropshire. Sheep.